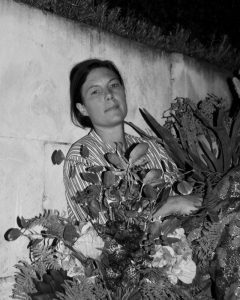 Stine Harttung is the creative force behind Flowerisme.com, a small flower studio in Hørsholm. Promoting a new look on and a sustainable attitude towards artificial flowers, Stine Harttung has followed her dream and with a distinct sense of handpicking the excellent and composing magic bouquets, she makes plastic and silk bloom. Working with artificial flowers, Stine is not bound by seasons or flowers that wither, so a bouquet – coral colored poppies mixed with black winter berries – is in its essence unconventional, it is sustainable and often also courageous. Because Stine’s flowers are artificial you can preserve them for as long as you like along with the memories they keep. View more work by Flowerisme here.